Every year, the Greater Cleveland Flute Society (http://www.gcfs.org/) hosts a student festival for middle school and high school students where all the young flutists get a chance to try piccolos, step-up flutes, altos, and basses with the vendors. The middle schoolers are completely over the moon that they finally get to try a piccolo and the big flutes. They rush to the table to be first in line, pick up the instrument with shining eyes, and attempt to play it with the set up that they use for their C flutes. Then they are frustrated because they think that all flutes are the same, regardless of the size, and they are mad that they can’t produce a good sound! After some basic instruction about head joint placement, air speed, embouchure hole shape and size, etc., they start finding some success. 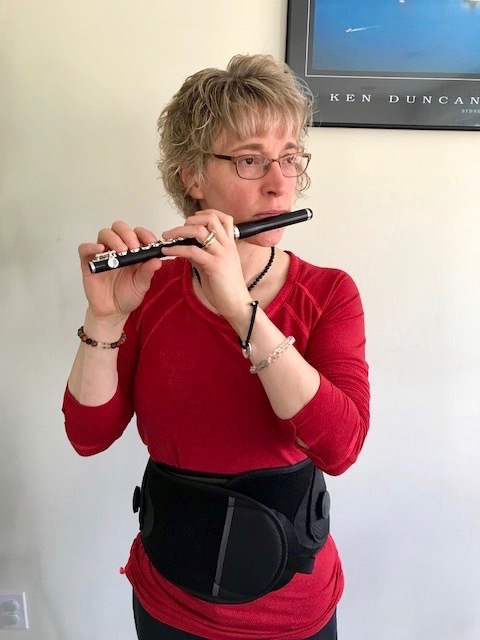 Flutists who have more experience with piccolo and large flutes are able to adjust to go from one flute to another quickly. Yes, they have the same fingerings and yes, you blow into an embouchure hole on one end. But they have their own requirements for air speed, air direction, intonation, just to name a few, that are dependent upon their size. We understand that all flutes work in a similar way, but they are not the same. One thing that does remain constant is the size of the person playing the various flutes. A curious thing happens to many piccolo players though, they tend to make themselves smaller because they are playing a tiny instrument. Their head comes forward and down and their upper arms often pull into the sides of the torso. The upper body seems to curl around the tiny instrument, keeping it nice and safe. Here’s a picture of what this looks like. Disclaimer from KW: At the time these photos and video were taken, I was on Day 6 after an unexpected surgery to deal with herniated disc fragments. The lovely back brace is doing what it’s supposed to do to support the lumbar area, but it limits free arm movement and definitely compromises rib mobility. Piccolo playing isn’t so hot as well since this is first time playing any instrument since surgery and I can’t breathe well due to the brace. But, I think a picture is worth a thousand words so I’m including some with this article. The picture below shows an arm structure that is not pulled in. Pulling in the upper arms limits the movement of the ribs, which in turn affects breathing mechanics. Piccolo has its own set of breathing requirements and we want to have full control over our breathing. When we inhale, the ribs move up and out as the diaphragm descends. On exhalation, the opposite happens. The ribs move down and in and the diaphragm returns to its fully domed position. 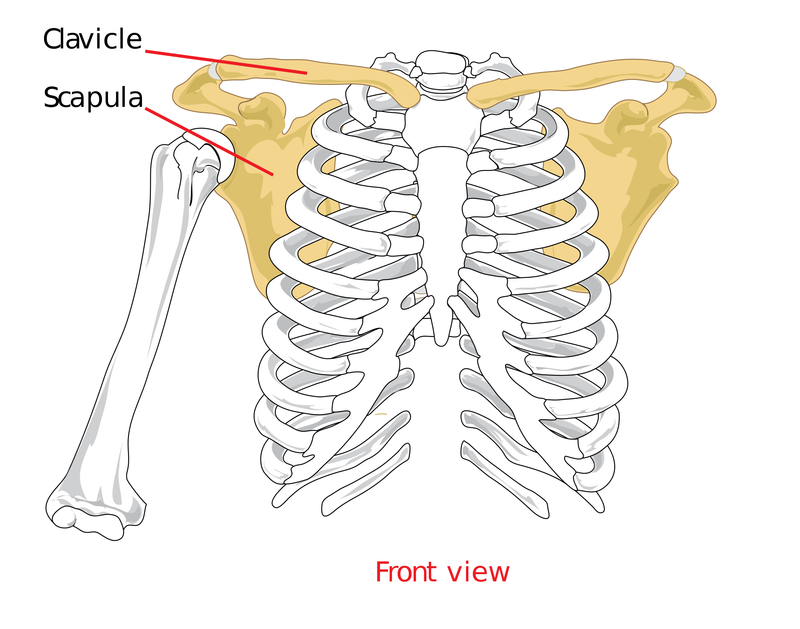 We have 12 pairs of ribs that attach to the sternum in front and to the thoracic vertebrae in the back. Many people don’t have an accurate body map of the upper ribs in particular. Rib 1 extends up above the collarbone! The ribs are white in the image below. Anything that keeps the ribs from moving up and out when inhaling is making breathing more effortful than it needs to be. We must understand that the whole arm structure includes a clavicle (collarbone), scapula (shoulder blade), upper arm, forearm, wrist and hand. Many people don’t have their collarbones and shoulder blades mapped as part of their arms. In fact, the only joint that attaches the arm structure to the rest of the skeleton is called the sterno-clavicular joint and it is located between the clavicle (collarbone) and sternum. 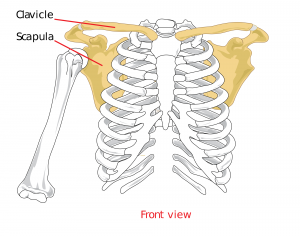 This joint is where the yellow clavicle meets the white sternum in the image above. Look at how long the collarbone is! Why so long, you ask? Its structure supports its function, which is partly to keep the rest of the arm structure up and off the ribs! So, if we aren’t pulling the upper arms in, there should be plenty of space for ribs to move. Here are few ideas to try with your piccolo. ~ Exercise 1 – Put something under your arm pits to help you feel the space between your arms and your torso. In my college teaching, I use 6 inch pieces of foam pipe insulation, one for each arm (https://www.homedepot.com/p/Everbilt-1-2-in-x-6-ft-Foam-Pipe-Insulation-ORP05812/204760811). At my home studio, I use half of a pool noodle. (https://www.walmart.com/ip/10-pack-of-24-Inch-Noodle-Builder-Noodles/512451830?wmlspartner=wlpa&selectedSellerId=6717&adid=22222222227066299012&wmlspartner=wmtlabs&wl0=&wl1=g&wl2=c&wl3=170907873960&wl4=pla-277878017236&wl5=9015378&wl6=&wl7=&wl8=&wl9=pla&wl10=115064716&wl11=online&wl12=512451830&wl13=&veh=sem). One end of the noodle goes in left arm pit, it wraps around in front, and the other end is in the right arm pit. Yes, it feels weird and looks funny, but give it a try! Put your foam spacers in a play for a few minutes. Then get rid of the spacer and see if you keep the space. Notice what happens to your breathing! ~ Put your fingers on your piccolo like you’re going to play middle D. Hold the entire piccolo up over your head. Then gradually float it over and down into playing position. Do not let your upper arms keep pulling in to your sides. Can you feel the space from Exercise 1? This technique often works because we’re trying to sneakily avoid a habit. Most often, we bring flutes of all kind into playing position from below. With this exercise, the flute comes from above. Both of these exercises work well with other sizes of flutes as well. 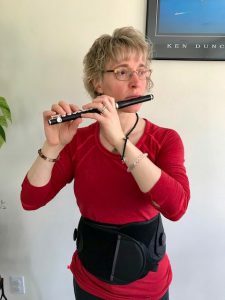 Keeping the upper arms from pulling in allows us to have maximum rib movement, which is absolutely something we need as players of flutes of all sizes. We do not need to make ourselves small for the piccolo—it’s not worried about its size!